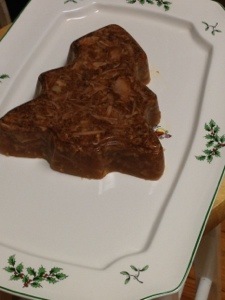 Nothing says Christmas like a tree-shaped hogshead cheese from Wayne Jacobs Smokehouse. May your holiday be safe, peaceful, joyous, and filled with delicious pork products. Yesterday I found Wayne Jacobs andouille buried in the freezer. Even though it is two years old it tastes just fine in the giant vat of gumbo. @Sarah, I hope your gumbo was delicious despite the aged sausage. Or maybe the aged sausage made it better? Merry Christmas and Happy New Years to you and your family Celeste! Thanks, Jim. Same to you! When u gon cook somin else? I’m tireda lookin at dat cheese. I’ve been eating junk and yogurt. Nothing to see here….